Between May and June 1999, as subcontractor to Sverdrup Civil, Inc. (currently Jacobs) for ADOT, ACS conducted data recovery at AZ U:5:33(ASM) in north-central Maricopa County. 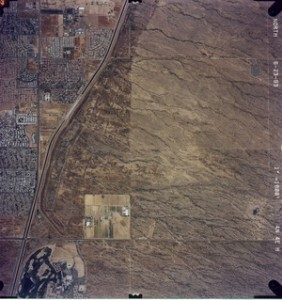 The site, originally recorded as a low-density prehistoric artifact scatter with fire-cracked rock features, was identified extending within the ADOT Pima Freeway (Highway 101) right-of-way and was recommended eligible for the National Register for its potential to provide important information about the area’s prehistory. ACS’ data recovery excavations revealed 18 features dating to the Late Archaic period (ca. 4800-1500 B.C.) in the upper site deposits; another 153 features dating to the Middle Archaic period (ca. 1500 B.C.-A.D. 1), including roasting pits and structures, also were discovered. Apart from the unique opportunity to examine a rare Archaic period occupation in the Phoenix basin, ACS’ data recovery at AZ U:5:33(ASM) demonstrated that, at least in the project area, surface cultural manifestations are poor predictors of subsurface cultural deposits. As the work shows, the dynamics of fan formation can remove and/or bury features and artifacts; surviving sites associated with the Middle Archaic fan can be expected to be deeply buried. The only sure method to determine the presence of these buried deposits would be extensive excavation, with trenches spaced at close intervals (ca. 5-10 m), across the entire bajada.